Leaves your best friend’s coat soft, plush, beautifully clean, and smelling naturally fresh for days. Also available in a 1L and 5L, please contact us for more information. 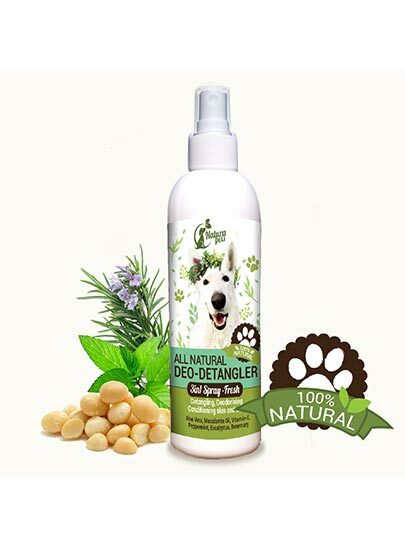 This dog spray naturally eliminates pet’s odour after or between baths and extracts the tangles of coat and softens the fur. This contains a soothing blend of botanical extracts that hydrate the coat and skin. Conditions and detangles the fur. 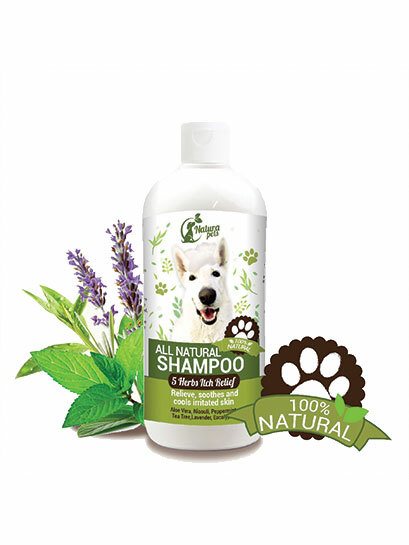 Naturally removes odour from your pet’s coat and without “cover-up” fragrances. Being alcohol-free the spray actually moisturizes, instead of drying, out your pet’s skin without leaving an oily feeling. 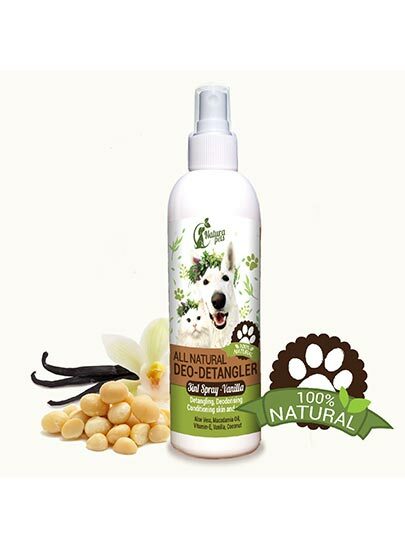 Essential oils deodorize while Aloe Vera, Vitamin E and Macadamia Oil help to condition and re-hydrate the fur. The natural scents match our shampoos. This dog spray naturally eliminates pet’s odour after or between baths and extracts the tangles of coat and softens the fur. This contains a soothing blend of botanical extracts that hydrate the coat and skin. Conditions and detangles the fur. 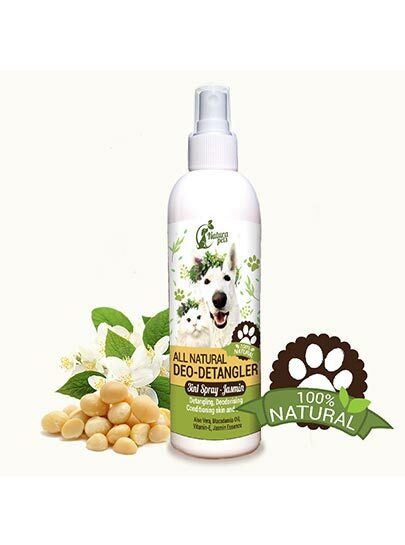 Naturally removes odour from your pet’s coat and without “cover-up” fragrances. 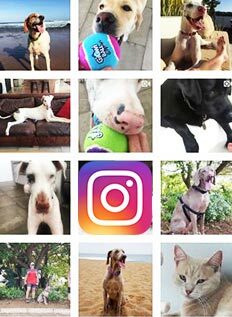 Being alcohol-free the spray actually moisturises, instead of drying, out your pet’s skin without leaving an oily feeling. Essential oils deodorise while Aloe Vera, Vitamin E and Macadamia Oil help to condition and re-hydrate the fur. The natural scents match our shampoos. 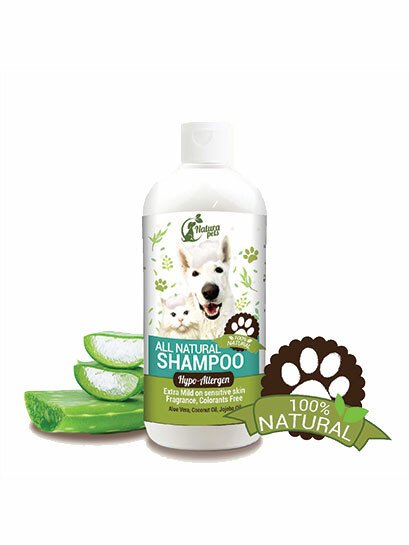 This Totally Natural moisturizing, conditioning Shampoo contains Orange oil which is an effective deodorizer, degreaser and fur stain, grease remover. Deep cleans, brings out the coat’s natural shine, and generates brilliant sheen. Lavender oil gives delicious scent. Jojoba and Coconut oil soften the coat, re-moisturizes the skin. Keep your canine & feline companions’ ears clean and relieve him/her from the discomfort of itchy, smelly and dirty ears. Always clean pet’s ears after swimming and bathing and when pet has been playing in insect ridden area. 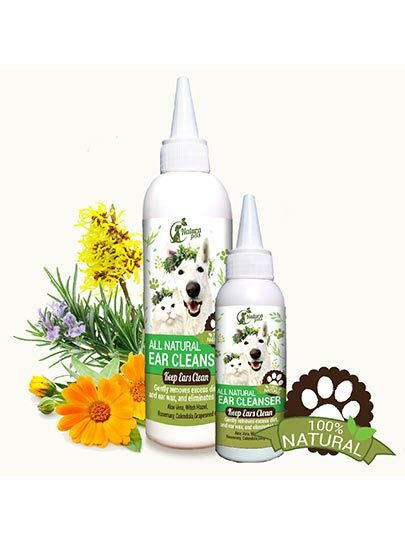 – This 100% Natural cleanser safely removes ear wax, debris and odours – The soothing natural ingredients will condition and moisturize, and help to prevent future infections – Safe, non-toxic and non-irritating even for dogs and cats with allergies and sensitive ears – Soothing organic oils, Aloe vera and Witch Hazel combine to create a healthy ear environment – It’s gentle enough for to use daily if you need to and after baths. 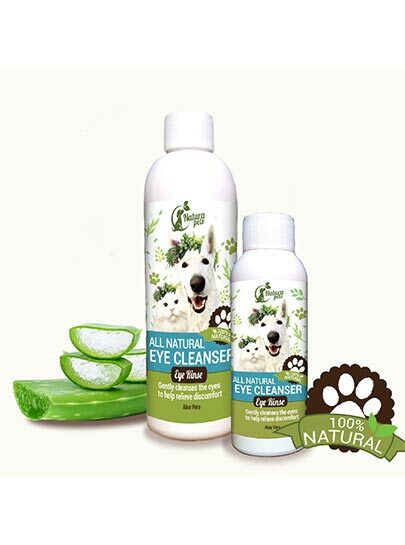 This ultra-gentle Natural Eye Cleanser from Natura Pets is made with 100% natural plant extracts. You can use this eye cleanser as an eye wash to wash tear stains and the bacteria away. Aloe Vera is healing and antibacterial for a number of eye diseases. Boric acid eye solution is very beneficial in fighting eye infections, irritations caused by foreign particles in the eye and air pollution (smog). Chemical-free eye wash brings back bright eyes and bushy tails. Reduce irritation from dried mucous, foreign material, dust, pollen, and ragweed after swimming in chlorinated pools or salt water. This rich deep Totally Natural conditioner is Coconut oil, Macadamia Oil and Shea butter based which moisturizes and conditions the fur and will leave your dog’s coat super soft and silky. Oatmeal softens, helps relieve dryness, and protects your pet’s skin. This conditioner is specifically free of any fragrance, coloration and Essential oils. Added Vitamin E also helps to promote a healthy, glossy looking coat. 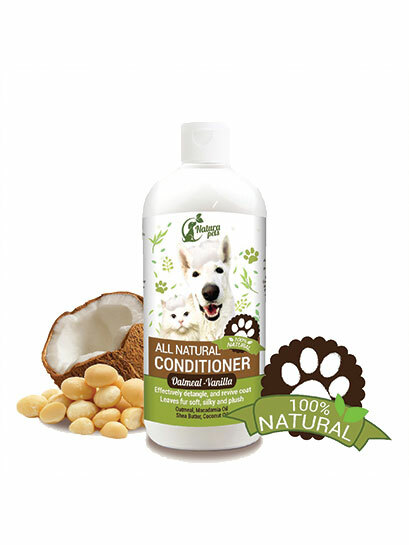 This rich deep Totally Natural conditioner is Coconut oil, Macadamia Oil and Shea butter based which moisturizes and conditions the fur and will leave your dog’s coat super soft and silky. Oatmeal softens, helps relieve dryness, and protects your pet’s skin. Vanilla and Coconut Essence gives a very delicious scent. Added Vitamin E also helps to promote a healthy, glossy looking coat. 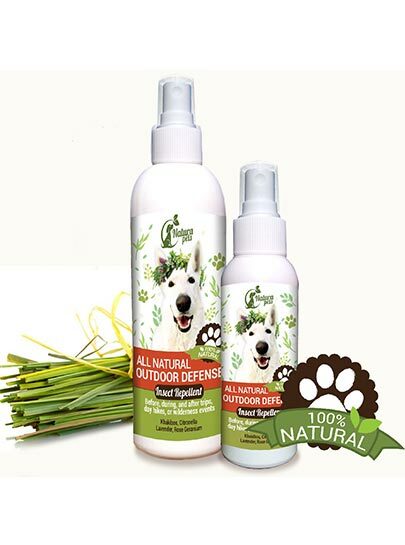 This Non-Toxic, 100% Natural Spray is filled with natural repellents for biting insects. Contains Essential Oils of Khakibos, Rose Geranium, Citronella, Lavender / Natural Ingredients are well known to protect from insects (mosquitoes, fleas, ticks). Use before, during, and after walking, hunting trips, camping trips, day hikes, or wilderness events. It can be used on most parts of the body. Spray onto bedding for more protection. It can also be used daily as a spray for mosquito season. This product does not kill the insects but repels them.